Review: Torn M, Bollen WL, van der Meer FJ, et al. Risks of Oral Anticoagulation Therapy with Increasing Age. Arch Intern Med. 2005 Jul 11;165(13):1527-32. 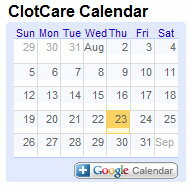 ClotCare Online Resource recently posted data from Elaine Hylek's group in Boston on how age affects the risk of bleeding and stroke in anticoagulated patients with atrial fibrillation with a target INR range of 2 to 3 (see www.clotcare.org/inrforelderly.aspx). In that report, the age-related risk of bleeding was not substantially increased except among those over 80 years of age. Investigators in The Netherlands have provided similar data on the effect of age on the risks of both bleeding and thromboembolism. It is important to note, however, that the typical target INRs in this study were higher than those used in the U.S., and the target ranges changed about one-half the way through the data collection period. Specifically, the patients included in this analysis included those with atrial fibrillation, myocardial infarction, and mechanical prosthetic heart valves. For the first half of the study, the target INRs were 3.5 (range 3.0 - 4.5) for atrial fibrillation and post-MI, and 4.0 (3.6 - 4.8) for mechanical heart valves. These targets were lowered mid-way through the data collection period to 3.0 (range 2.5 - 3.5) for atrial fibrillation, and 3.5 (3.0 - 4.0) for post-MI and mechanical heart valve patients. It should be pointed out that even the lowered target INRs are higher than the target INRs recommended for these conditions in the United States. As indicated below, the events (both bleeding and thromboembolism) increased with age especially for the patients over 80 years of age. The degree of anticoagulation control range from 61% time in range for those over 80 years of age to 68% time in range for those 60 to 70 years of age. Even though the target INRs were higher than those used in the U.S., the relatively tight control of the INR intensity resulted in lower event rates that what has often been reported in non-clinic patients in the U.S.